Disclaimer: Deb Brown, Executive Director of the Webster City Area Chamber of Commerce invited the North Iowa bloggers to spend a day in Webster City as part of the “Six Bloggers on a Saturday” tour in December 2014. I received some free products from Relax the Bath as a result of this trip. All of the opinions stated here are 100% my own. Being a woman in the world today is much different than it was when my grandmother was young. Today women are a vital part of innovation and creative endeavors and are encouraged to do things that years ago would not have been possible. I have been amazed at some of the women that I have met since I began blogging 7 years ago and feel that I need to pay homage to all that can come about once a woman puts her heart and soul into a project. 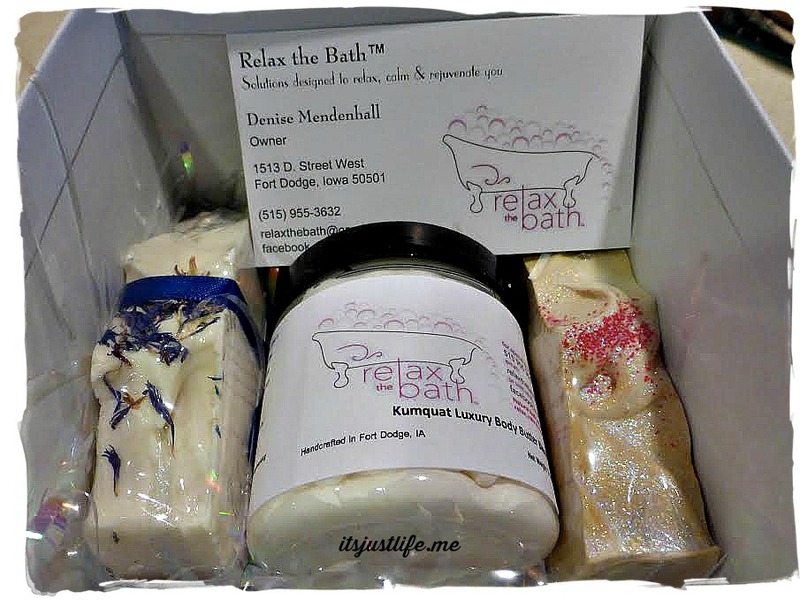 The first woman that I would like to share with my readers is Denise Mendenhall who is the owner and creator of extraordinary products at Relax the Bath based out of Fort Dodge, Iowa. Denise is a savvy businesswoman but perhaps what attracted me to her even more is her insistence to produce a quality and SAFE product. 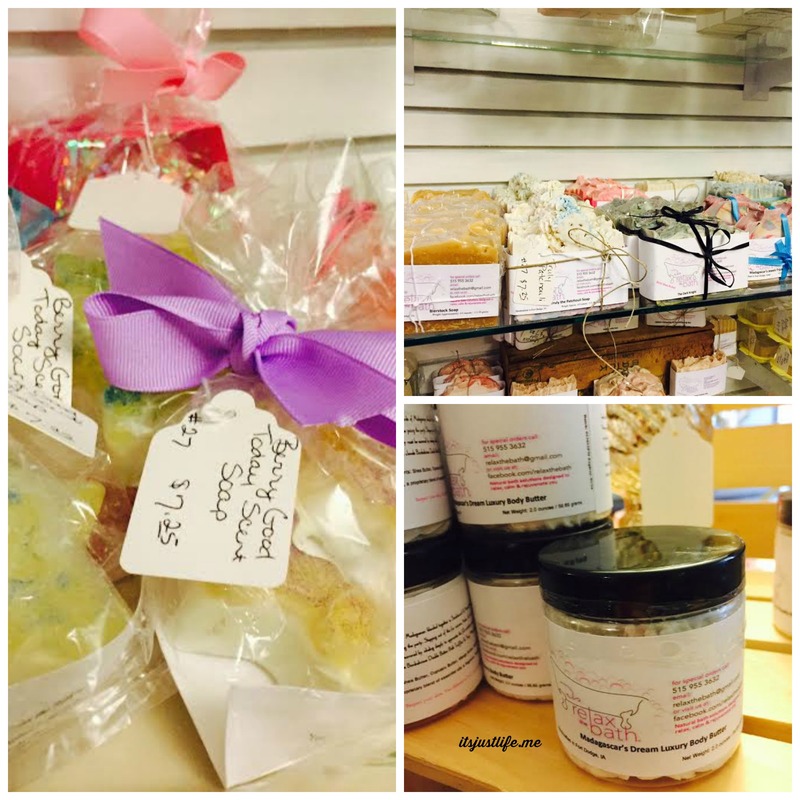 Her line of products ranges from lip balms to soaps to body butters and more. Her tagline is “Natural solutions designed to calm, relax and rejuvenate you” and that in itself describes Denise. 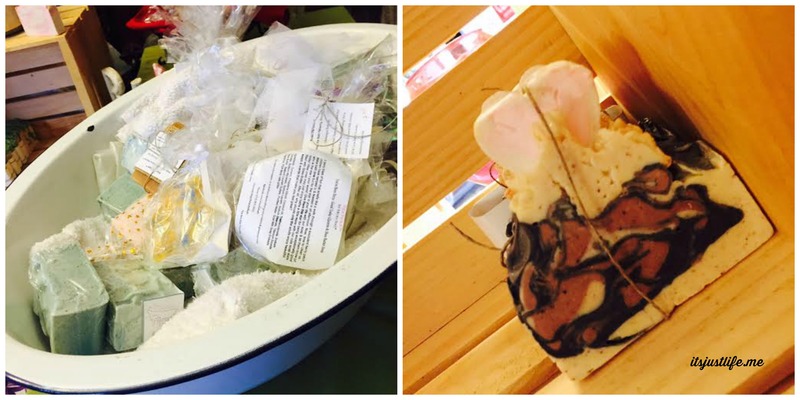 I was gifted a lovely selection of soap and body butter when the North Iowa Bloggers visited Webster City back in December. I will be honest—I did not get to actually explore the goodies until January because life was busy. Once I opened the lovely box I was thrilled to discover two bars of soap and a generous container of Kumquat Luxury Body Butter which is heavenly. Simply heavenly. The day the bloggers visited was cram packed and we were not able to linger long at SOS Vintage where Denise has an attractive display of her items so I was itching to go back. Jeni of JeniEats and I made a follow up trip in late January and I was thrilled that Denise was actually in the shop so we were able to talk to her for quite awhile and learn about her passion for her products. I have always been a fan of all things bath related but my shopping was usually limited to Bath and Body Works and the occasional Body Shop purchase but since moving to Iowa I have become a fan of the hand crafted bath products that seem to be at every farmer’s market and vendor show. Denise takes a special pride in her creations and shared with us that she looks at the European markets for both inspiration and trends. She also is a stickler for safety and good marketing practices and makes sure that her products have batch numbers and expiration dates. Each item that she offers carries an informative label and this label contains both the batch number along with an expiration date. Now why doesn’t every one do that? I fell in love with the body butter she gifted me back in December and had my eye on the bath bombs on display and before I could say anything else she made sure I had one to take home with me. I promise you I was fully prepared to pay but we just had such a nice time talking and connecting with Denise that day that I think she felt like I did –a new friend was made. Denise confessed to us later that she was usually very happy in her own space creating and mixing body butters with her 5 KitchenAid mixers (YES) but seeing the fun that the North Iowa Bloggers always seem to have she wanted to come join us for a day. Of course she is invited anytime! 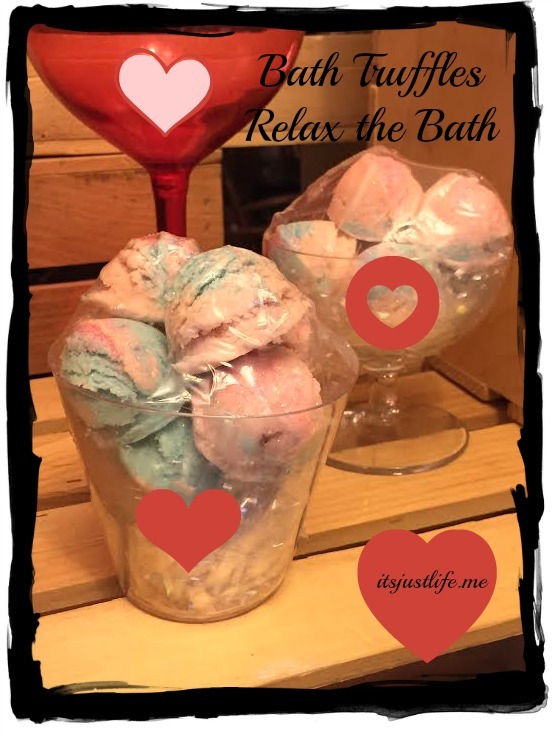 If you are a lover of fine quality bath products I would encourage you to check out Relax the Bath. Denise has items fully stocked at SOS Vintage in Webster City and also has an Etsy shop here and a direct shopping tab here on her Facebook page. She is always available for special orders and would love to have a conversation with you about her products and what she can create for you. The day we chatted with her she was recovering from a recent surgery and was anxious to get back to work on products. I seemed to have caught her with her eyes almost closed as well –hey–I did not notice until I added the picture. I do not claim to be a professional photographer. Probably more than the fact that I love these products is that I loved meeting the woman behind the product. Denise is a genuine and lovely person who has created a product line that she is passionate about. Her passion translates into a little bit of love being poured into every item that her hands create. She is an amazing woman who living her life to the fullest and sharing her gifts with the world. That is who I like to be around. People that have a zest for life and who love what they are doing. Denise is a prime example of that and I am happy to introduce her to you. Stay tuned for more “noteworthy women” in the future. The world is full of them. You have to love a businesswoman like Denise who carries a strong passion for what she does. That is what I loved about talking with her. She loves what she does and making a truly wonderful and safe product is key to her. Gotta love that integrity. What fun products! I also love bath and body products and now you make me want to road-trip to Webster City…especially since I’ve missed both times now! Those bath bombs look like a divine way to lose myself in a house of boys!! Katy – Those are actually truffles that are at the top. I was taking photos as I do at every event, prior to the ladies coming in for my own records and social media. The truffles make bubbles and have butters in them as well as smell great. I make them in a variety of fragrances and essential oil blends. Looks like a nice line of products! So glad you made a new friend, and shared her story with us. Thanks, Dianna. She really is a wonderful woman. Happy to share her with you guys! Vicki, Thank you so much for stopping by! Yes–her products are fabulous in every way and these Iowa winters are hard on the skin so it is nice to have some products to use to pamper ourselves with, right? 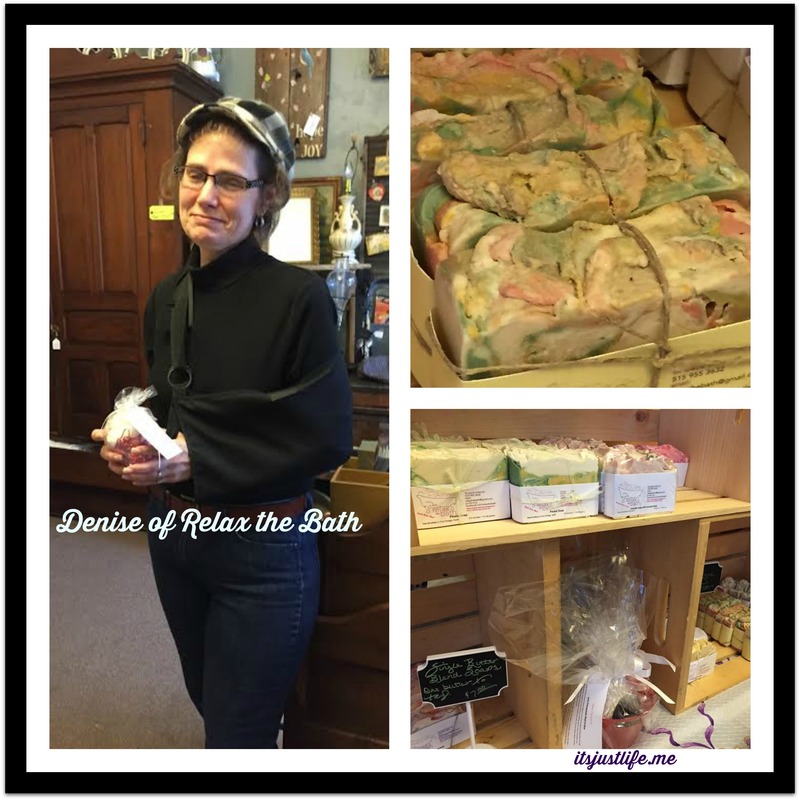 Absolutely and Denise’s products definitely make you feel like you are being pampered. Luscious body butters that actually melt into your skin as you watch and leave it baby soft! Additionally, her scents are heaven sent; she has the fragrances your nose will LOVE!!! Your skin deserves the best and that is exactly what you’ll get!! Lindsay– thanks for stopping by! I love how loyal her customers are! We all agree she has quality products! This sounds so nice. Your N. Iowa Bloggers group sounds like so much fun. What will you fo when you move? I love their body butter! I so want to try those bath truffles now too! The bath bombs are fun as well but the body butter is fabulous, isn’t it?